Stephanie L. Rogers, Ragweed. From the Urban/Environment installation, part of Arts on Chicago. Courtesy of the artist. During a recent event at The Third Place Gallery, photographer Stephanie L. Rogers was asked why she needed two hours to take a picture, shooting with film no less. “Because I spend two hours walking around trying to find something interesting,” she said with a laugh. What she found interesting and has displayed in the gallery, and put on poles or placards installed along Chicago Avenue and adjacent side streets between 32nd and 42nd, are photos of a duck eating a Cheeto in a parking lot, a vine twisted around a wire, a half-eaten melon propped up against a fence, a weed growing from a crack in the sidewalk. 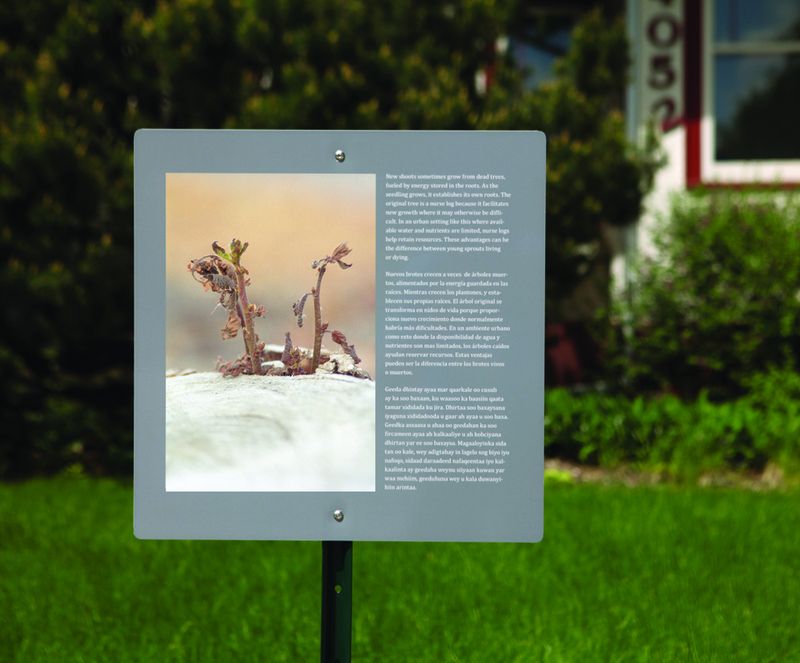 Finished sign at 4052 Park Avenue installed in a front lawn as part of Stephanie L. Rogers’ Urban/Environment project. Installation photo by Ben Hovland. 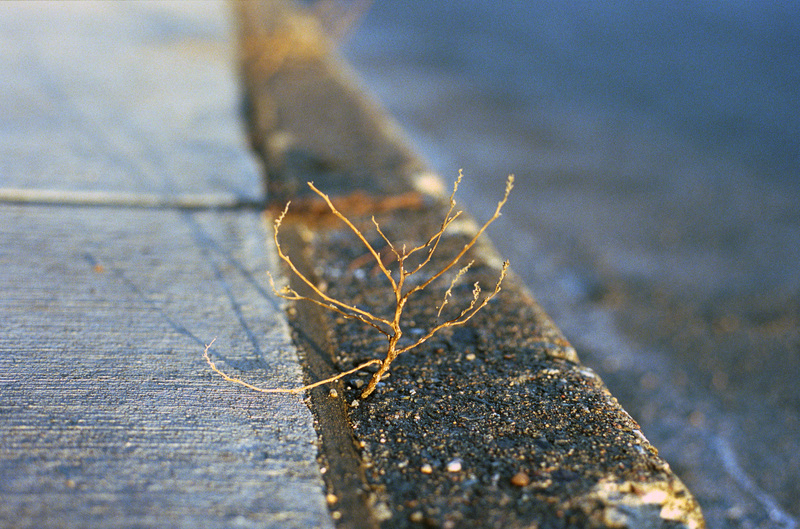 Titled Urban/Environment, a project of Arts on Chicago, Rogers’ photography “explores urban ecology along Chicago Avenue, focusing on natural beauty in unexpected places, the fragility of life, and the tension between man-made structures and living organisms,” as the website explains. What she’s accomplished—as a young photographer whose aesthetic infuses her work with freshness, detail, wonder and a charming naivete—is inspiring viewers to pay close, or at least closer, attention to how nature asserts itself in some of the most inhospitable places of the city. 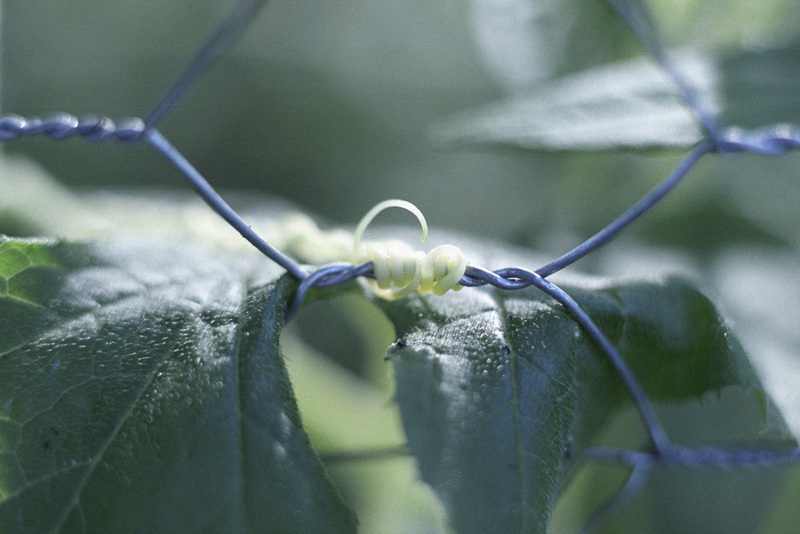 Zucchini with chicken wire. Photo courtesy of Stephanie Rogers. Rogers selected 37 photos (two additional images were taken by students at the Urban Arts Academy) for the project. The images are displayed on signs that can be found in storefront windows, on metal posts in private yards, or zip-tied to fences. On each sign, along with the image, is didactic information that contextualizes simply, and sometimes with humor, the effects of pictured juxtaposition of nature and the human-made. 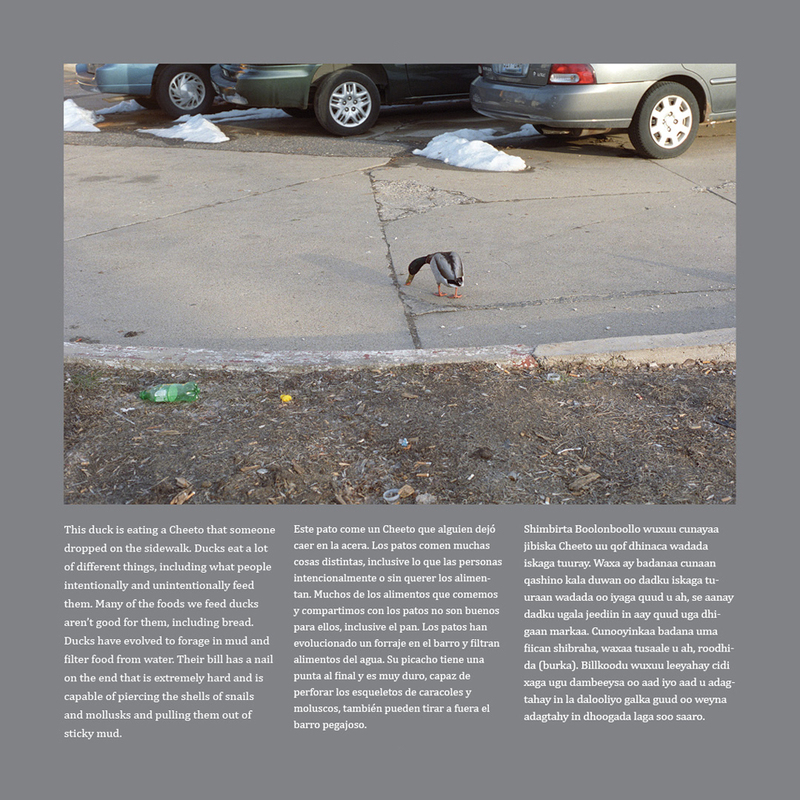 The duck image, for instance, offered Jacob Richards and Megan Buchanan, the bio-geographers who worked with Rogers on the text, the opportunity to explain how animals adapt to our trash and why that’s not a good thing. Duck sign courtesy of Stephanie Rogers. The descriptive text purposely mimics interpretive state park signage. And, like the placards along self-guided nature trails, Urban/Environment seeks to educate and enlighten—and from time to time, cajole. So, while the project entices even the jaded eye, photographic and otherwise, to pay renewed attention to the subtlest of the natural world’s forceful instincts—a sorrel plant whose blooms grows against a window to draw in the most plentiful light; tiny new buds growing through the leafy detritus of the past year—I’m reminded of books by Gary Nabhan and Stephen Trimble decrying the lack of nature, and natural play, in children’s lives. 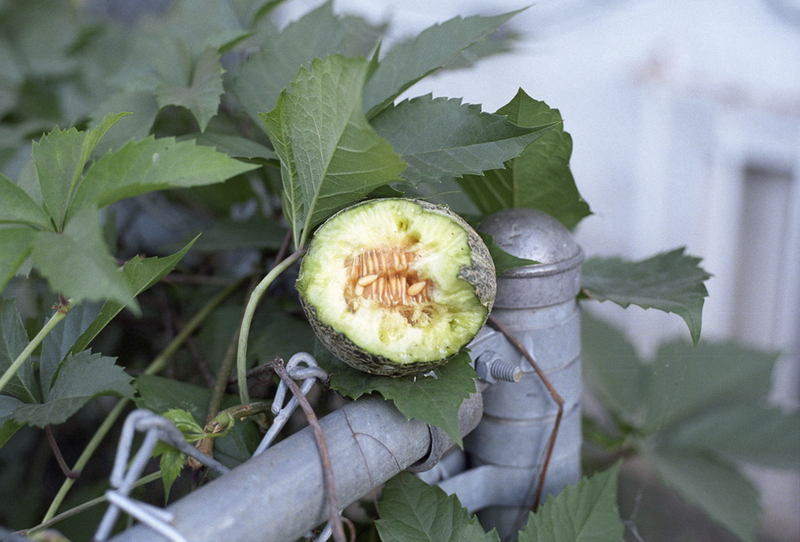 Melon and Virginia Creeper. Photo courtesy of Stephanie Rogers. Perhaps the greatest gift Urban/Environment gives to city dwellers, especially children and families living near and along Chicago Avenue, is the opportunity to walk through the neighborhood with fresh eyes, an open heart and a hungry intellect. Because the text is in English, Spanish and Somali, because the images often capture nature at the micro scale, and because together text and photo interpret the intersection of science, city and the natural world, the project has the potential to change young lives. “[W]ildness—even in its simplest forms—can nourish a lasting attachment to the earth, and, in turn, nurture self-esteem,” writes Nabhan in The Geography of Childhood: Why Children Need Wild Places. Urban/Environment maps for self-guided tours are at The Third Place Gallery. Rogers herself will also lead walking tours on June 30, July 13 and July 27.